Dubai, UAE, April 01, 2019: The 46th Watch & Jewellery Middle East Show 2019 will kick off tomorrow (Tuesday) at the Expo Centre Sharjah, with impressive participation of more than 500 local and international exhibitors and brands representing 18 countries from around the world. Held under the patronage of His Highness Dr. Sheikh Sultan bin Mohammed Al Qasimi, Supreme Council Member and Ruler of Sharjah, and with the support of the Sharjah Chamber of Commerce and Industry (SCCI), the event will run from April 2 to 6. Expo Centre Sharjah reaffirmed that all preparations have been completed for hosting the show, the largest and long-running event of its kind in the UAE and the region. The event stands today as an indispensable international platform for displaying the latest designs of watches, jewellery, diamonds and precious stones. The bi-annual exhibition provides visitors the opportunity to buy directly from manufacturers and offers them a chance to win daily valuable prizes through lucky draws on every purchase of Dhs. 500and above. The Mega raffle draw prize will be 1 KG GOLD, which will take place on the last day of the show. All general visitors registering onsite will be entered into a raffle draw for a chance to win 18K Diamond ring. The raffle draw and prizes will be monitored by Sharjah Economic Development Department (SEDD) all days of the show. 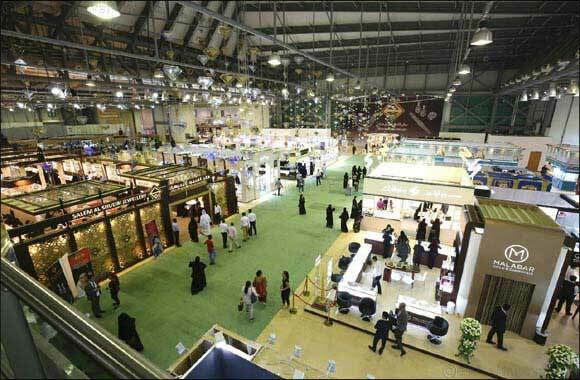 The 30,000-square-meter exhibition will see the presence of an elite group of leading jewellery and watchmakers from Bahrain, China, Canada, Hong Kong, India, Italy, Japan, Lebanon, Lithuania, Pakistan, Saudi Arabia, Singapore, Thailand Turkey, the United Kingdom, the United States, Yemen as well as dozens of UAE companies. For the first time, Canada will be taking part in the five-day event, while India will be having the largest pavilion with exhibitors showcasing the season's most exquisite and intricately crafted jewellery creations. HE Saif Mohammed Al Midfa, Expo Centre CEO, said: “Besides being a major platform for the region's gold, jewellery and watches trade, the Watch and Jewellery Show has become an increasingly attractive destination for leading international companies, brands, traders and designers seeking to enhance their presence in the region,”. He reiterated that the show’s conducive environment allows for building excellent business relationships between suppliers, dealers, brand makers and end-purchasers, especially as the Expo Centre Sharjah is the only centre in the world that organizes such an event twice a year. Sharjah Chamber of Commerce and Industry (SCCI),” Al Midfa said, adding that the show has successfully attracted major international companies, brands and thousands of visitors from around the world. The show opens its doors to the public on Tuesday and Wednesday from 12 pm to 10 pm. It will also be open on Thursday from 12 pm to 11 pm while on Friday; it will be open from 3pm to 11 pm. On Saturday, the exhibition opens from 12 pm to 10pm and will be exclusively reserved for women on Wednesday from 12 pm to 4 pm. Admission are free for all.